Every January, the J.P. Morgan Tournament of Champions attracts thousands of squash players and fans from around the world to the glass court in Grand Central Terminal. Spectators at the tournament include former champions, amateur players, local fans, and members of squash and education programs, including StreetSquash. Each year, StreetSquash is fortunate to be involved in a number of different ToC events, including the Women’s Luncheon, a clinic on the glass court, and opportunities to watch various rounds of matches and to serve as court helpers. 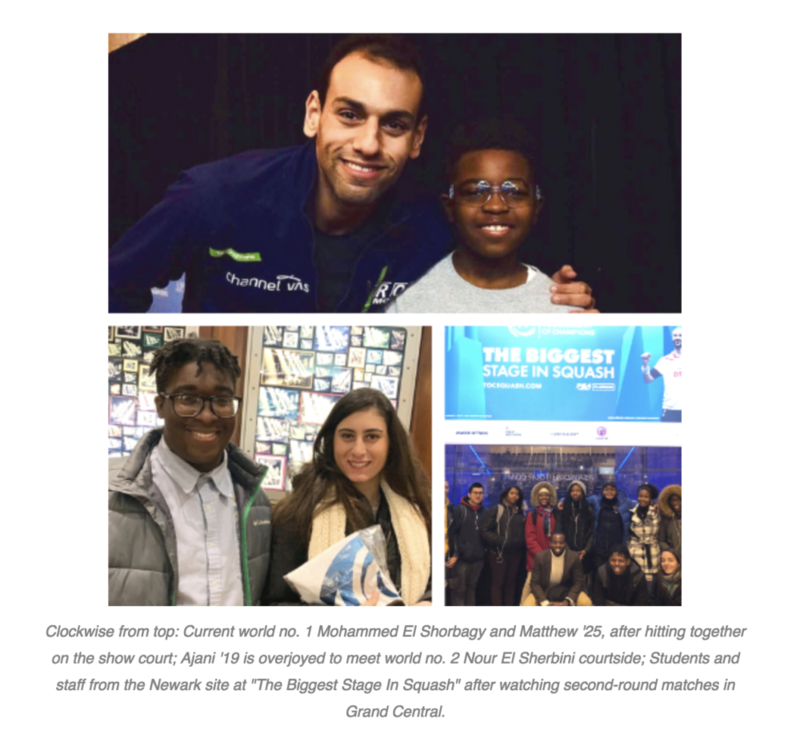 Senior Ajani was especially excited to return to the tournament, where he had the opportunity to meet Egypt’s Nour El Sherbini, this year’s ToC champion. Attending the tournament for the first time, Matthew ’25 earned a highly coveted session on the glass court with Mohammed El Shorbagy, current World #1, having impressive rallies with the pro to help him warm up for the tournament. After playing, Matthew made sure to give Mohammed some tips about moving up to defend against drop shots. By the end of the tournament, Mohammed made it to the finals, likely due to Matthew’s coaching! Not surprisingly, the ToC’s energy expands beyond Grand Central Terminal. For over a decade, StreetSquash has been fortunate to host Nick Matthew, 3x world champion, and more recently, Nicol David, 8x world champion, during the week of the ToC. On Friday, January 18th, and Friday, January 25th, the two squash legends returned to the SL Green StreetSquash Center to speak about their experiences as professional squash players with the program’s middle and high school students. 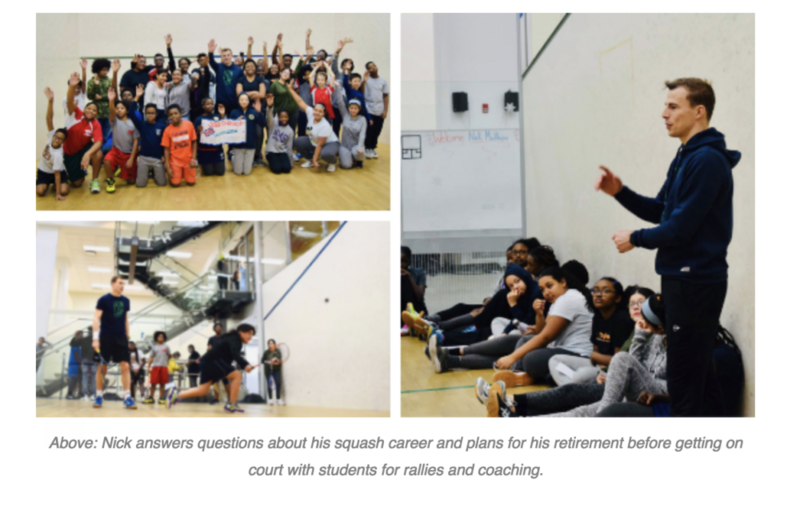 Nick, now retired and based in the UK, spoke about his plans to visit more squash programs like StreetSquash, school teams, and clubs to help grow the sport worldwide. Nicol, who played in this year’s Tournament of Champions, discussed her training regimen as a touring professional and the challenges and triumphs of being at the top of the sport. 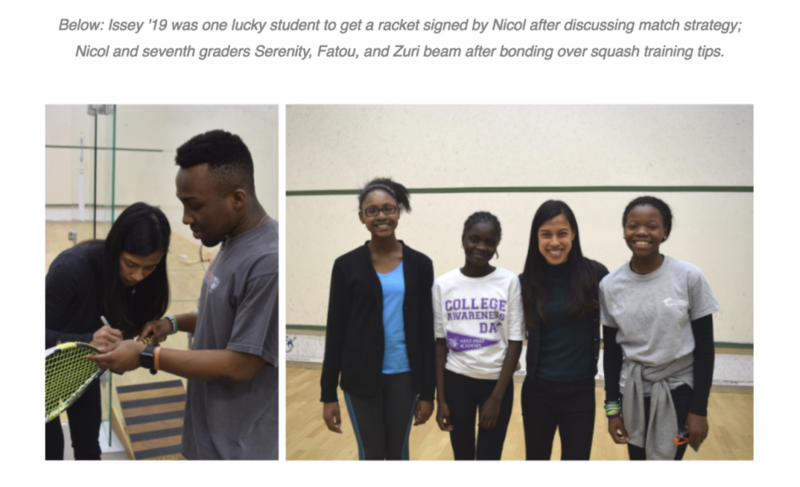 “Nicol was so down-to-earth while sharing her wisdom with the students,” Squash Director Jack shared. “Even newer students could see the passion that she needed to get to where she is today, and it really inspired them,” he added. Thank you to Nicol and Nick, who serve on our Professional Squash Advisory Board, for their time and motivating words for our program participants.